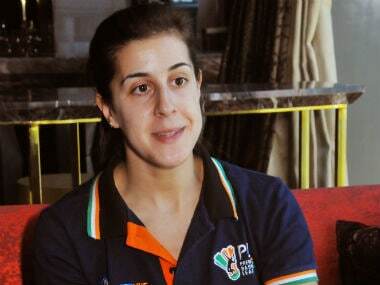 Mumbai: While PV Sindhu upstaged her counterparts with elan to end a 13-month long title drought, Spain's Carolina Marin was busy cheering for her off-court buddy, albeit as a spectator. Marin, who had withdrawn from the season-ending tournament due to a niggle in her right knee, was left in awe of Sindhu's patient display and the fine form that propelled the Indian ace to finally break the jinx at the top level. A spirited Sindhu thwarted Beiwen Zhang in the lung-opener, before upsetting World No 1 Tai Tzu Ying and Akane Yamaguchi in the group stage. The 23-year-old went on to master the technical and the physical battles against Ratchanok Intanon and Nozomi Okuhara in straight games en route her first-ever World Tour title. "I have been in touch with Sindhu since the semi-finals stage as I was in China to attend an event for the Badminton World Federation (BWF)," the 2016 Olympic gold medallist told Firstpost. "I told her the day before that I’m with her, and I wished her best of luck. We exchanged messages during the tournament. I was really happy that she could finally break the jinx. I congratulated her for the win," she continued, passing on the Hyderabad Hunters’ leadership to Sindhu in this year's Premier Badminton League (PBL). Although Marin has won nearly every major final, she still understands Sindhu's tribulations of being second-best at major events. "It's really difficult to play in so many finals and be on the losing side. It's not easy to change this thought in her head. So, it's good that she overcame that hurdle at the right moment," Marin, who will play for the Pune 7 Aces added. Meanwhile, the 25-year-old Spaniard was a notch above all at the Nanjing World Championships in August as she continued to smother opponents left, right and center at the Japan Open and China Open crowns in September. "My season got better at the end because I made so many changes to my game for the World Championships. I was disappointed with my injury during the World Tour Finals but this is what happens when we play so many tournaments in a year," said the three-time world champion. At the start of the season, the former World No 1 had said that she would use the first half of the tightly-scheduled year to regain her peak fitness and complete the mandatory tournaments quota. The unerring guile of Marin guided her successfully despite following the obligation of playing a minimum of 12 events in a calendar year. "Sometimes, the preparation for big tournaments for me is really important and I did great there. After that, the high-intensity preparation is difficult to maintain. When you force yourself, you are bound to get injured. We're human and not robots," she said. Marin was instrumental in helping Hyderabad Hunters win the title last season on home turf and the Spaniard will now be plying her trade for new outfit Pune 7 Aces and insists it is the adulation she gets in India that makes her return to play in the league every year. "With so many talented players and a young squad, we're a strong side now," she concluded.